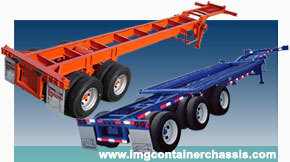 Flatbeds, Dollies, Gen sets, Dry Vans, Refrigerated trailers-Reefers, Lowboys, axles etc. You may contact us with your request for a quote by email or by phone. 1. A detailed Quotation with pictures of chassis or equipment you are interested in buying. 2. Quotation will be in US dollars, showing a FOB price at the most convenient USA shipping port. FOB: Free on board. It means price at the USA shipping port. 3. If you prefer us to coordinate all exportation procedure (inland freight, custom paperwork, ocean-maritime freight). Then our quote will be in terms CFR at the port of destination (Port in your country). CFR: Cost and Freight. It means FOB price plus maritime freight amount. 5. Once the equipment has been shipped, we will send you the original shipping documents by DHL, UPS, etc. Original shipping documents will allow you to clear out the equipment from customs in your country.